Do you love rolls? Well, we do. My family and I love rolls. 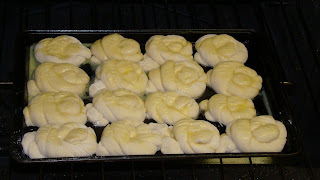 Just recently, Jason made some rolls and they were really good especially when you put butter on it. He loves to make home made bread so I always get the chance to eat some home made fresh bread. My son loves Jason's bread too and he called it "daddy's bread". We love homemade bread because it is substantially tastier than store-purchased bread. It tastes better, it reduces preservative intake, it’s more nutritious, and it’s often substantially cheaper than what you find in the store. It does take time, but once you get used to it, most food preparation does not take much more time than going to the store, buying it, taking it home, popping it out of the package, and following the directions. So, try to make some bread for your family, they will surely love it. 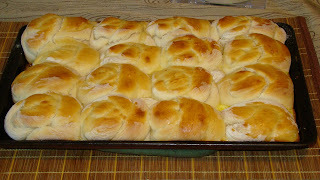 If you want the recipe for the rolls that are in the picture, just let me know. I will send it to you.